The APC InRow Direct Expansion by Schneider Electric has a product design that closely pairs the cooling with the IT heat load. This design prevents hot air recirculation, while improving cooling predictability and allowing for a pay-as-you-grow environment. 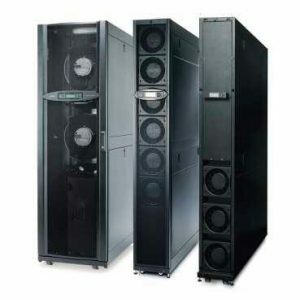 Available in self-contained, fluid cooled, and air-cooled configurations with or without humidity control, these products meet the diverse requirements for closet, server room, and data center cooling. IT operators looking to improve efficiency or deploy higher density equipment will benefit from the modular design of the InRow Direct Expansion products. The intelligent controls of the InRow Direct Expansion products actively adjust fan speed and refrigerant flow to match the IT heat load to maximize efficiency and address the dynamic demands of today’s IT environments. In-Row architecture – Captures hot exhaust air directly from the IT equipment, thereby increasing the unit’s sensible cooling capacity over traditional cooling architectures.